There are many reasons you might want a new fence for your home (or to replace the old one). Perhaps you have a pool that legally needs a fence around it. Perhaps you’re tired of nosy neighbors. Maybe you have a pet that needs to be kept in your yard. Those are only a few of the reasons you might need a new fence. Whatever your particular reason, you need a qualified contractor to make sure that the fence replacement or new fence installation goes smoothly. Luckily you’re at the right place. First Class Fence & Access Control is an experienced contractor capable of taking care of any of your fencing needs. Whether you want a privacy fence, garden fence, picket fence, or something completely different, we’ve got the expertise you need. Contact us today and schedule your free estimate in Glenview, IL! As a commercial property owner, some of your biggest concerns are security and appearance. Fortunately, a new fence can help you tackle both of these issues with one stone. Not only will a new fence create an attractive exterior, but it will also help keep unwanted guests out. Our solutions can be further customized to meet your specific needs or vision. We also know that construction can sometimes interfere with an otherwise productive work schedule. When working with us you can rest easy knowing we’ll coordinate with you to choose the best time and also work quickly to minimize the impact on your employees, tenants, or customers. A gate is excellent, but only if it doesn’t cause inconvenience for you and your guests, customers, family, or employees. That’s where a gate operator comes in. Automatic gate operators especially let the people who need to enter do so easily while still keeping unwanted guests out. Read to get started on your fence replacement or new fence installation? 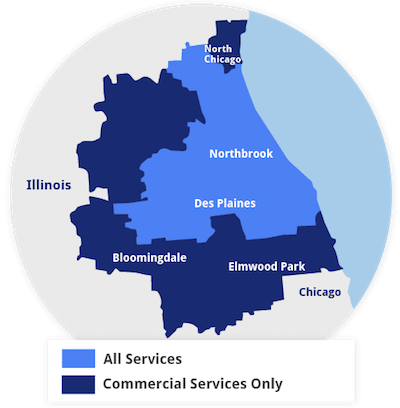 Contact us today and schedule your free estimate in Glenview, IL!